Hey, Maybe it’s’ You–you must admit this is a great title for a book dealing with all of our personal crap, excuses and reason for not becoming who we can really become. So what is stopping us? 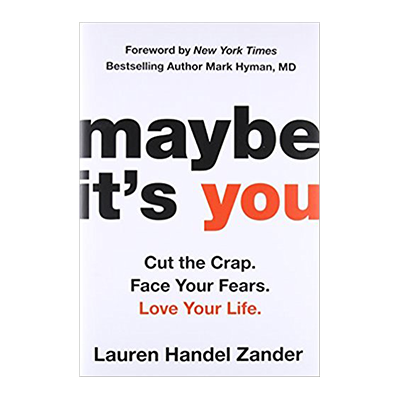 Great question, and in my interview with author Lauren Zander about her new book entitled “Maybe it’s You, Cut the Crap. Face Your Fears. Love Your Life” we really get down to brass tacks about the real issues. This is a no bars, authentic, get in your face interview. What I love about Lauren is that she only knows how to tell the truth, and while this requires being vulnerable, open and raw that is what we all need to do. We need to let others around us understand our pains, needs and desires, and in turn we hope they will share what is on their mind with us so we can cultivate better more loving and compassionate relationships. I discussed a very sensitive issue with Lauren and that is something she called “personal integrity”. Just why is it that the ability to make and keep a promise to ourselves is so hard. How is it that we will keep promises with others, but more than not break promises with ourselves. As Lauren puts it we are out of alignment with our heart, mind and body. When we can keep a promise to ourselves, we can become proud, and we can trust our decisions. Happiness, self-esteem and personal pride come from knowing you can count on you. Lauren’s new book is filled with great advice, including helping us learn how to dream again. As a matter of fact having people write down their dreams is one of the first exercises in the book and is bound to get you excited and engaged in learning more about how you can fulfill your wildest dreams. If you want to learn more about Lauren you can click here to go to her website, she is also offering what is referred to as “The Current Reality Quiz” just click the link to get access. You also can get a no-obligation consultation by clicking here. I hope you enjoy this lively interview with author Lauren Handel Zander.